NatureRails balustrade railing systems are fabricated using heavy duty spindles, newel posts and incorporate a unique look that is all your own. Our products are safe, reliable, and beautiful works of art that also function as a railing. Easy to install, our products can be configured with the exact spindle you would like and a newel post size of 3 to 4 inches. Our decorative baluster border added to your spindle railing will keep your guests asking, “Where did you say you got your railing?” With so many options, the railing is as unique as you are. So easy, just follow the simple steps below to receive a complete quote on your project. 3. What style of spindles do you prefer? Hammered or simple square? 4. Which decorative border would you like to use? See choices above. The price of the railing depends on which border you select, the length of the railing, type and quantity of spindles used. $149 per foot and up for a standard 36-inch rail height. Sorry, baluster installation not available. However, it’s easy enough for you or your contractor to install with our detailed baluster installation layout plan prepared for your job. Custom work is a major part of our business. If you would like a different border, we have an award-winning nature artist on staff that can design anything you can imagine. Maybe you would like a different color choice? We have access to 100’s of quality powder coat colors. 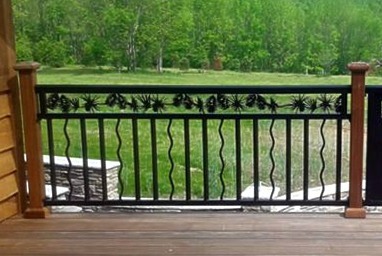 Customers have often combined these baluster railings with our other custom railing products. Take a look at our product photo gallery. Never needs painting! Always looks amazing! Are you designing a new deck, verandah, or porch for your home? Maybe you are doing a DIY project, or renovating a home. This can be an exciting time, something you have worked toward for years. Don’t you want a deck railing system that lasts longer than the time it took to build your home? So often baluster railing is painted and rusting in less than a year. You just renovated, and now you have rust stains on your deck or stairs, and the wood is turning gray from the weather. You can stop looking now, as you have found the right place to get top-quality balusterswith that decorative touch to set your home apart. Our baluster railing is thick, high-quality, and durable. Just ask our customers, they are thrilled when they get their products installed. Why are NatureRails Products the Best? From concept to delivery your order is treated with white glove service. We remember when customer service with a smile and a quality product was the foundation of a successful business. We still follow that model and treat every client’s railing with the level of detail we would put into our own custom railing. Ready to call now and let us do the rest? Call 888-743-2325 and we can go over details and provide you with a written estimate. Would you rather get to know us a little better? Then please keep reading. The process of your dream balustrade system starts with all-American hard work. Once you determine your desired spindle size, decorative baluster border choice, color and sizes needed—then let us do the rest. Sounding overwhelming already? Email your napkin drawing of your total area sizes or architectural plans and we can estimate your deck or balcony railing. Don’t draw? No architect? Send photographs of your area and we can discuss the possibilities available for your new custom balustrade railing. If your space is ready, one of the first things to determine is your newel post size. You want to ensure proper support according to the post size selected. Your newel post size should take in account your final spindle size. NatureRails offers 3″ and 4″ metal posts, sold separately, or use your own. Once you have your measurements, along with a deposit we can begin designing your baluster railing. Your detailed design sketches are created and emailed to you for review and sign off. Reviewing you design sketch ensures your proper size, look & price of your new Decorative Baluster Railing. After approval of your design sketches, fabrication begins. Your decorative border insert is fabricated with high quality precision water jet or laser cut, depending on the design. Next, all your components are hand welded by a certified welder. To ensure your products look great and stand up to any weather condition we have added these additional steps to the manufacturing process. First, a two-step cleaning process is done to ensure proper powder coat adherence. A rust inhibitor is added in a wash that is applied to the product after sandblasting is completed to remove any mill scale or dirt from the fabrication process. Whether you select steel or aluminum, your product will be carefully powder coated in one of our many gorgeous, durable textured colors. Unlike paint, powder coat will not rust, crack or fade. It is durable, looks beautiful and requires minimal maintenance! An additional primer powder coat layer is also frequently used for exterior steel railings. Of course, you want your home to have the wow factor, a place you love telling people “I live here!.” Maybe that place is the beach. You paid how much for those views? Or maybe you live in your log or timber frame home in the woods, a perfect place to enjoy your new custom home. Even if it’s a renovation for a fix and flip, what better way to not only add safety to your deck and railing area but do it in a way that sets your home apart from the others on the market. What if you didn’t have to worry about stability in a railing because it would be all American made products of high quality? Or maybe you love the look of NatureRails wildlife art panels, but you still want ample view with some decorative features for your new deck along the bay. With NatureRails, you really can have it your way.